It’s important to purchase a product that’s easy to install without a plumber. Multiple combos for delivering streams of water is a major plus as well. This is a 2-way shower head. So, the package comes with two shower heads, one you can hold in your hand. The Hydroluxe shower heads are a bit more expensive than most products you’d find in the market. But considering you get two in the package, it’s definitely worth it. The shower heads can be used individually or in combination. It’s really easy to use because all the necessary attachments are included in the package. The Hydroluxe is made from all chrome. The product is metal, so there’s no stainless steel in it. These two shower heads have 24 functions! That means you have 24 individual and combined water flow patterns to choose from. The flow patterns include massage, mist, and “power rain.” You will certainly appreciate the latter when you come home from the gym. There’s also an “economy rain” flow function that will save water. It’s great for the dry season, especially if you live in California. The handheld shower head comes with the hose attachment. It’s made from stainless steel so there are no corrosion worries. The Hydroluxe comes with a 10-year warranty from the manufacturer. The warranty is valid if you buy directly from the company only. The Hydroluxe has a pause button to relieve water pressure if necessary. The button doesn’t completely stop the water flow though, because there will be some drip. The SomovWorld 6-inch showerhead delivers a soothing rainfall-like spray of water. It’s suitable for homes that have both high and low water pressure. It has a metal mesh filter. The filter prevents dust and grime from the outside entering inside the shower head and causing clogging. Do note that the mesh filter doesn’t remove minerals or metals dissolved in the water. It’s not a water filtration device. The shower head is beautifully designed. It looks a lot more elegant than the actual $20 price tag. The nozzles are self-cleaning. You won’t have to use toothbrushes to clean the water jets in this shower head. The silicone water jets have an anti-clogging feature to remove lime and hard metals. You can safely use this shower head even if the water in your area is hard. The shower head is made of ABS plastic. It won’t rust or corrode in any way. The metallic look comes from the chrome polish on the outside. The head is not actually steel. Installation is really easy. The package includes Teflon tape and an additional water filter, so you won’t really have to buy anything else to install. The water restrictor is removable. When you really want a strong gush of water, just remove the restrictor and you can enjoy a thoroughly cleansing shower. There aren’t that many downsides to this product. It could do with a water pressure control feature, and perhaps a gentle massage function. Are you seeking a shower head that can satisfyingly deliver a high-pressure spray of water to cleanse away the dirt and grime of the day? Then this Speakman is probably what you are looking for. The shower head is single and compact, it should suit pretty much any bathroom. The water jets are so powerful you won’t even need to remove the water restrictor inside. It has 48 combinations of water sprays. Users can actually customize the sprays to their liking. The advantage is that you can change the spray from intense to a gently soak for optimal showering experience. The shower head has 6 plungers can you can adjust the spray by rotating as you like. 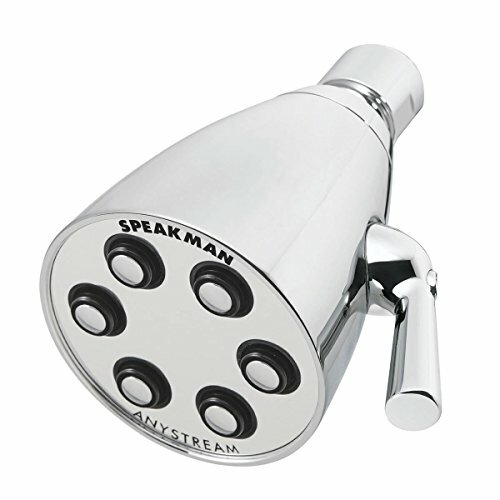 The shower head rotates seamlessly because of the patented AnyStream design. However, don’t expect much diversity between the spray patterns. This shower head is made of metal. It has a gorgeous, polished chrome finish with a mirror-like surface. The inside is actually solid brass. The downside is that you can’t use any harsh chemicals like vinegar to clean. The shower head is quite heavy. Users should be careful when installing because of this. There are hardly any downsides unless you count the price. This shower head costs close to $100, which is significantly above the average price for shower heads. Enjoy the best of both worlds with this 2-headed shower combo. One head attaches to the bathroom wall, and another is handheld. You have a good selection to choose from when it comes to this shower head. The size varies from 4 inches to 7 inches. You can also buy the product with a stainless steel slide bar. Prices for selections vary, starting from around $20 to $60 for the most expensive selection. The shower heads are made from ABS plastic and some parts in stainless steel. The exterior is chrome plated so it doesn’t look plastic at all. For a 2-headed shower, this was really easy to install. There’s no need to call a plumber because everything is included in the package, even the Teflon tape. The shower head comes with six settings. Not as many as other products above, but it’s got all the essentials like rain, mist, and massage. The water pressure is quite good for the main head. It’s not as high for the handheld second head. The pressure goes down when you use both heads in combination naturally. Overall, the water pressure is quite good for everyday showering. It’s hard to pinpoint in downsides for this wonderful product. However, there is a noise issue that might bother some. The shower head has a slight crackling noise that can be somewhat annoying. Other than that, this is perfect for daily needs. Do you live in a home with low water pressure levels? Then this shower head is certainly worth considering. It’s specially designed for households that don’t have high water pressure in the interior plumbing system. First off, the water pressure certainly isn’t perfect. But it can reach high water pressure levels up to 1.8 gpm. That type of pressure is really a dream, especially if you live on an upper floor of an apartment or a house. There are certainly shower heads that deliver better results, but probably not if the existing pressure is low. This shower head comes with 3 settings only. That’s not much, but it’s got rain and massage. The jet nozzles are made from silicone and rubber. It won’t corrode and the nozzles prevent the build-up of hard water minerals. The shower had and the mounting brackets are made from plastic. It does have a flimsy feel to the whole thing, but that’s only a minor issue. Installation is super easy. You won’t need power tools; just screw it into the existing pipe where the old shower head used to be. The price is definitely very affordable as well. And the package includes everything you need for installation. Single head shower heads are quite self-explanatory. You will get only one shower head that you can attach to the bathroom wall. The shower head won’t be flexible. That is, you won’t be able to hold it in the hand. 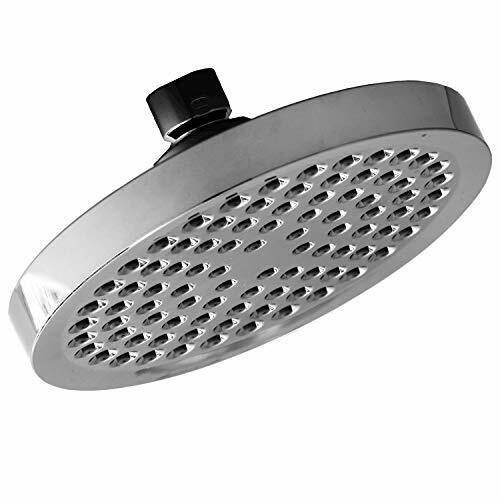 Double-headed shower heads are products that technically include two shower heads. One attaches to the wall, and another is handheld. You will get a slide bar for double-headed showers. You should attach the handheld shower head to this part and it will be easy to adjust the level. These shower head products might be slightly more expensive considering you essentially get two shower heads in the package. Most buyers are quite concerned about water pressure when it comes to shower heads. No one wants a shower head that cannot intensely spray out water. Water pressure of shower heads largely depends on the water pressure at your home. 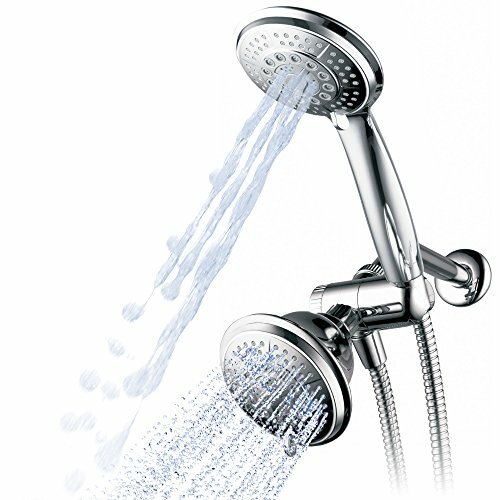 However, some shower heads are designed to be “high pressure” products. These shower heads can deliver a significantly strong spray even if your home water pressure is low. But keep in mind that even “high pressure” shower heads are dependent on the interior plumbing system. After water pressure, you might want to consider the type of spray the shower head delivers. Most popular products these days have a combination of sprays. The rain shower is the most common because this is the type that delivers intense jets of water to get the sweat off after a workout session. Other combos you might want to check will be massage, mist, and economy spray. The latter saves water. Shower heads vary in the number of combinations offered. Some offer only two or three combos, while others can offer over 40 combos. However, don’t judge the quality of the shower head based on the number of combos offered. The products that offer a high number of combos may have sprays that are not too different from each other. A large number of combos can indeed be useful. But don’t base your purchasing decision solely on this. Do you live in an area with hard water, or with a lot of particles in the water? Then make sure the shower head comes with a filtration gadget to remove particles and metals. This will also protect parts of the shower head. A filtration device also prevents clogging at the nozzles. Most shower heads do come with this feature, but it’s best to double check in the product description. The affordable shower heads are made from ABS plastic. The material is tough, lightweight and doesn’t corrode. Plastic shower heads may be covered in a chrome finish to make the shower head look like it’s made from a metal. Chrome finishes are beautiful but could peel off because of harsh cleaning solutions. Metal shower heads are heavy, but these are very sturdy. These shower heads are most likely made from stainless steel to prevent corrosion. Otherwise, the shower head must have some type of coating to make it rust-resistant. Metal shower heads are great because, unlike the rather flimsy plastic, you can expect them to last. Size is also a factor you might want to consider. The diameter of the spray is determined by the size of the shower head. You might prefer a large shower head with many jet nozzles. But if you have a small bathroom with a small stall or a tub, you might want to go with a small shower head. If you are buying a dual-headed shower with a handheld portion, make sure the check the size of the adjustment bar and the hose. Purchase a shower head that’s easy to install. Otherwise, you might have to call in a plumber or drill holes in the bathroom wall. A warranty matters. A long-term warranty will protect your purchase, no matter how much you paid for it. Some shower heads can be noisy. 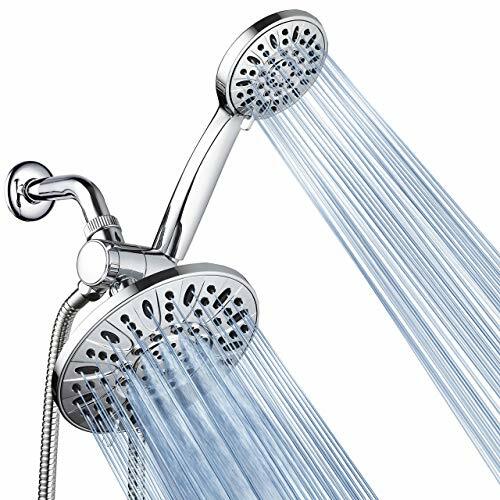 It’s not a major problem with many products, but it’s worthwhile to read reviews to find out if the shower head generates more noise than most. Before you purchase a high-pressure shower head, check the optimal water pressure allowed in your area. The shower head should deliver jet sprays at pressures below this standard. Don’t assume that an expensive shower head would be better than a less expensive one. Prices can go up just because of the material the shower head is made of. Therefore, look at the features, not the price tag. Shower heads are by and large affordable when you buy online. To distinguish the best products from the subpar, look at the distinct features as explained above. 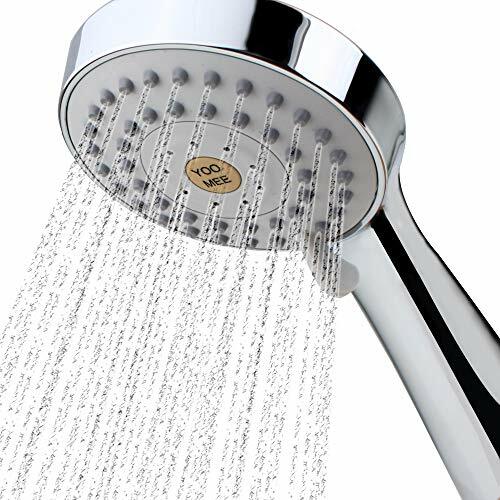 You would generally want a showerhead that delivers sprays at a good water pressure level. The other main thing to look for is the combination of jet sprays available. Pay attention to the installation ease and construction material as well. Lastly, protect your purchase with a solid warranty.